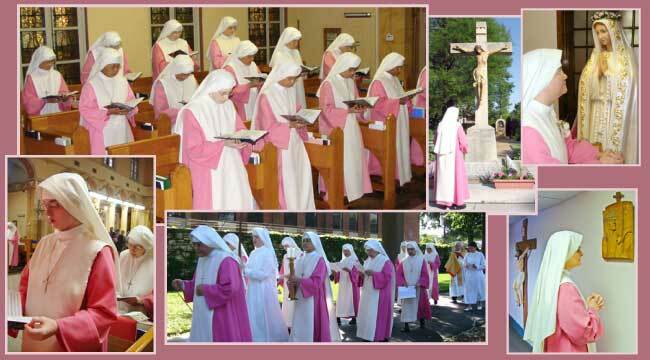 We are a cloistered-contemplative missionary Congregation, living in community, whose members are entirely dedicated to the contemplative life in the service of perpetual adoration of the Blessed Sacrament. The Church's missionary activity and the sanctification of priests are particularly remembered in our life of prayer, which includes the singing of the Liturgy of the Hours (Divine Office) in choir. We carry out our service in close union with the Lord, whom we follow in a life of poverty, chastity and obedience. The Papal enclosure that we observe is a special way of being with the Lord, its totality signaling our absolute dedication. Freed from distractions, our hearts expand to include every need and distress. 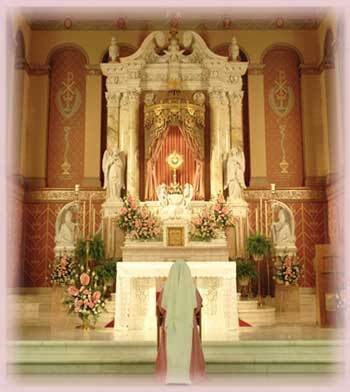 Before the Eucharistic Throne, we adore God on behalf of our brothers and sisters throughout the world. The rose color of our habits, which we wear in honor of the Holy Spirit, symbolizes the joy of our dedication to the Third Person of the Blessed Trinity. Our way of life witnesses to the basic truth that God alone is the true center of being and the goal of history, that he alone can satisfy the longings of the human heart, and that every good thing comes from him.